you can ask have your parents do it for you. 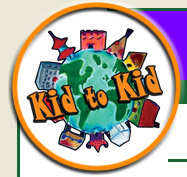 Kid to Kid is designed to give children the opportunity to help other children that lack the things we take for granted every day--like food, clothing and shelter. Look around and see what other kids are doing. Changing Lives in Uganda ! Maya (14) lives in Geneva, Switzerland . Every month, she sends a shipment of books to Charis Center, one of our sponsored orphanages in Uganda . This is a wonderful, life-changing gift for the children there, who normally would not have access to such wonderful materials. Maya, your good will and charity are reaching hundreds of children and opening up new worlds to them through your books! They are also very encouraged to know that a girl in Switzerland is thinking of them every month. Thank you! 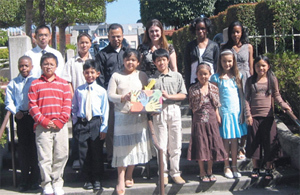 The piano students of Kim Hinkley performed a Summer Recital on Father'sDay, June 18, 2006 to benefit Children's Hunger Relief Fund. The recital, held at All Saint's Catholic Church in Hayward, California featured students from age 7 to "grown up" playing a variety of styles, from Chopin to "Star Wars." This celebration of music was an effort to make a difference in the lives of hungry children all around the world. Their goal of reaching $500 in donations was surpassed when they raised over $950. Thanks to Kim and her students for sharing their evening of entertainment to help benefit the hungry children of the world.